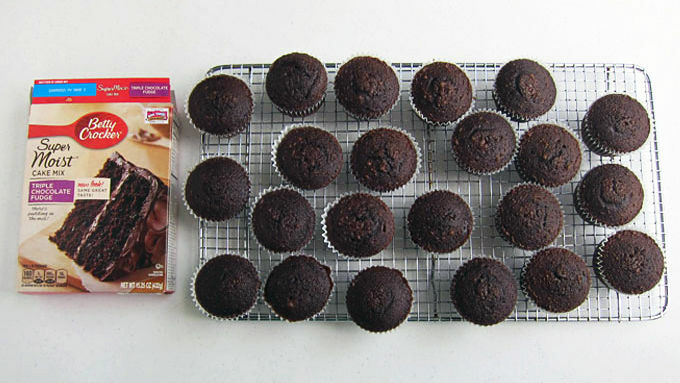 Bake cupcakes according to package instructions. Allow to cool completely. 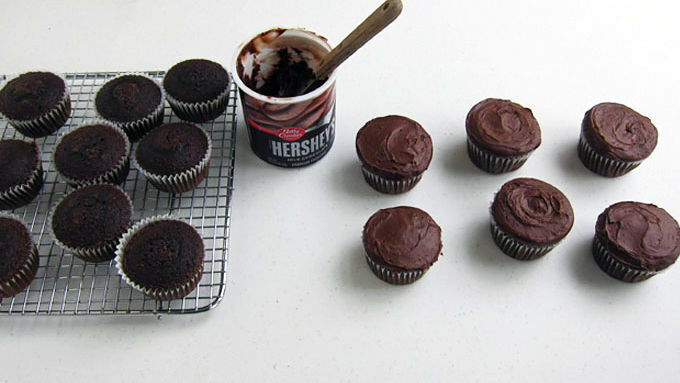 Frost cupcakes using Betty Crocker™ Hershey's™ milk chocolate frosting, using as much or as little as you'd like. Smooth out the frosting making the tops of each cupcake flat. 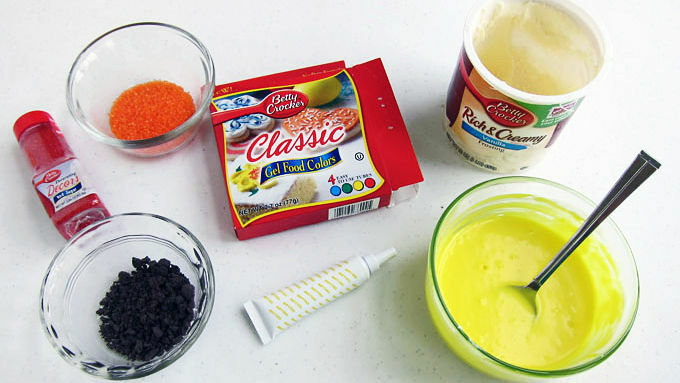 Color the tub of vanilla frosting using yellow food coloring. Scoop out into a microwave safe bowl. Heat in microwave for 15-25 seconds until melted. Spoon some yellow frosting over center of one cupcake, leaving about 1/4-inch border around the edges. Immediately sprinkle on some cookie crumbs, orange sugar and red sugar to make each cupcake look like it has coals and flames in it. Repeat, creating all 24 cupcakes. Pipe grill grate lines over cupcakes using black cake icing. 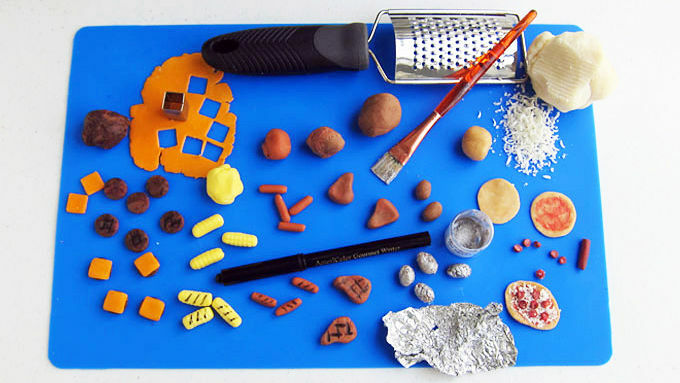 Color and shape modeling chocolate into hot dogs, hamburgers, cheeseburgers, corn, steaks, potatoes, and pizzas. Add grill marks using a black food coloring marker and brush on silver luster dust mixed with clear vanilla extract to mimic aluminum foil. Use some leftover frosting or cake icing to attach the modeling chocolate food to the tops of each grill. Next time you fire up the grill for a big cookout, bring these grill cupcakes for a fun summertime treat! If you walk through my neighborhood on any summer evening, you'll smell fresh cut grass and meat smoking on a grill. Like most folks, during the warmer months we tend to migrate outside to enjoy the beautiful weather and the taste of good food cooked over a fire. Recently we were invited to one of these cookouts and since I was asked to bring dessert, I thought it would be fun to whip up a batch of grill shaped cupcakes to honor this warm weather tradition. Not only do they taste great, they look super cute and are a popular treat for summer parties. I wanted my cupcakes to be a bit unique, so I sculpted some unusual food using modeling chocolate and tossed them onto my tiny grills. In addition to the hot dogs, hamburgers, cheeseburgers, and steaks, I added some grilled corn on the cob, baked potatoes that look like they were wrapped in aluminum foil, and even pizzas. 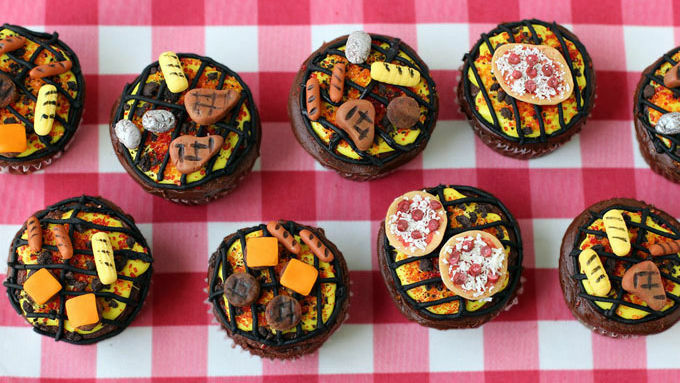 I love all of these things cooked on a real grill, and they looked especially cute on top of my grill cupcakes! To make the fondant food decorations, I first made a batch of modeling chocolate. I colored the modeling chocolate to look like the food, then sculpted it into hot dogs, hamburger, cheeseburgers, cut pieces of corn on the cob, steaks and pizzas. Then I added grill marks using a black food coloring marker. To make the cheese-topped pizza, start by making a crust and then brush on some red food coloring to be the sauce. Take a ball of white modeling chocolate and run it over a fine cheese grater. Add that "cheese" to the top of the pizza and add some modeling chocolate pepperoni slices or whatever toppings you'd like. To make aluminum foil-wrapped baked potatoes, create a potato shape out of modeling chocolate and roll it around on a piece of crumpled up aluminum foil to add some texture. Then combine a small amount of clear vanilla extract with some silver luster dust and paint it onto the modeling chocolate potato to mimic aluminum foil. 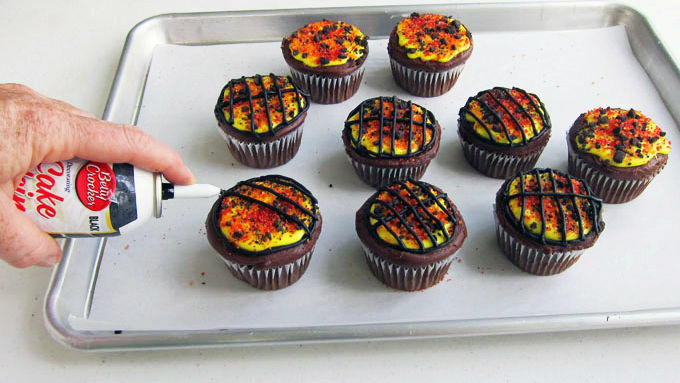 Allow it to dry completely before adding it to your grill cupcakes. 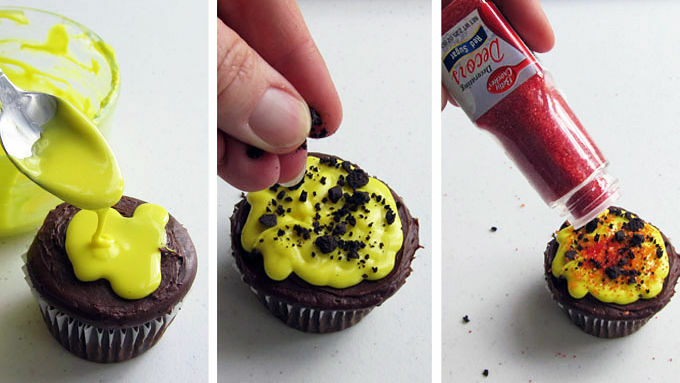 Use some leftover frosting to attach the food items to each grill cupcake. And voila! 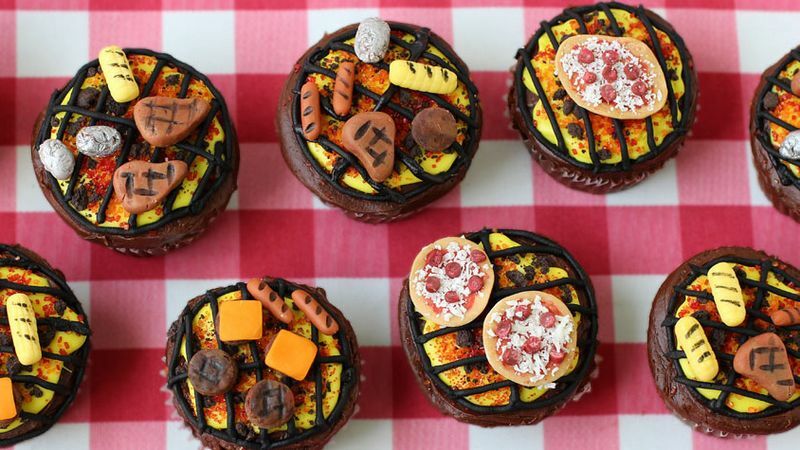 Cute grill cupcakes that are sure to be a hit at your next party!